If we were able to choose how we perform our travels, we would always choose the shortest path but sadly we aren’t able to fly, at least without proper help. Nonetheless, Circular Reasoning will revolve around the same principle, where players will have to find themselves the shortest route to the center, but sadly it will be no easy travel, as you’ll carefully have to plan your moves because you never know when a passage may appear. The entire package, except for the classy looking box, looks quite simplistic/minimalistic. Whilst the board itself looks decent and will certainly suffice, the pawns might leave some players wanting more. There will be four sets of three different pawns, namely a square, a triangle and a circle. Even though these pawns have their charm for an indie game, the random markings on some of them feel a bit out of place. Nonetheless, it’s a case of love or hate. Put your gray matter to the test in the upcoming race to the finish. 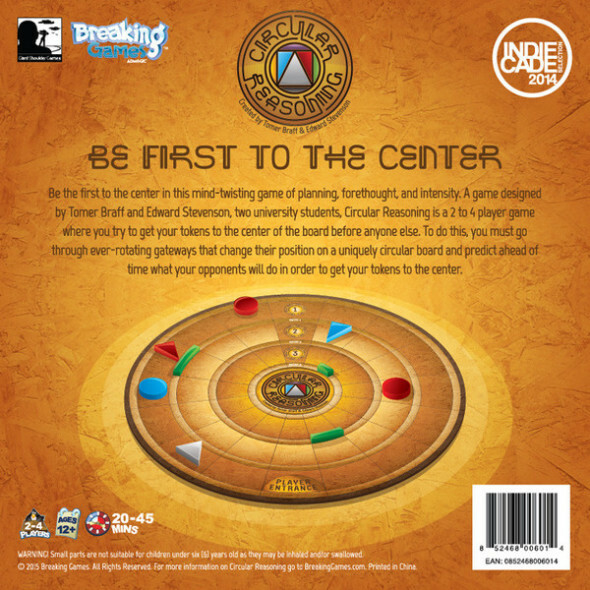 In Circular Reasoning you will have to be the first player (2-4 players) to get all of his pawns to the center first. You’ll have to do this whilst other players might take advantage of your position. Take into account all your pawns have different move sets (the Square moves four spaces ,the triangle moves three spaces and the circular one moves two spaces) and keep track of where the gates (to cross over to another layer closer to the center) are. 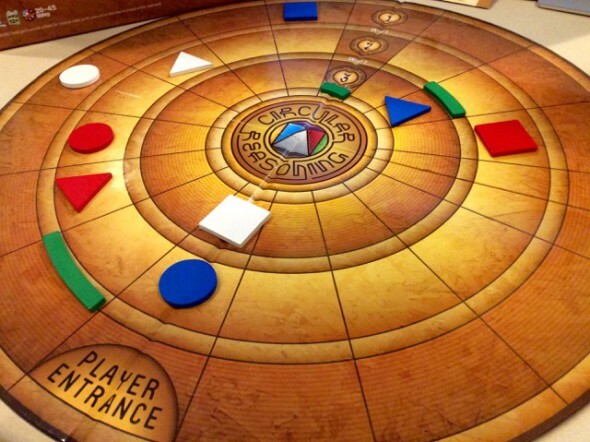 The board itself consists out of three circular layers, which you’ll have to go through in order to reach the center. During each turn, each player can only move one of their pawns on the board, before that ‘round’ ends. After each round, another player will get the starting move, thus spicing things up quite a bit. When playing a two player game, it means each player will pretty much go twice in a row, with the moving of the gates in between. As just stated, the gates you’ll have to pass through to get to the inner circles, and finally the center, move after each round. The gates will move clockwise depending on how many pawns in that circle. For example, If the outer circle has three pawns, the middle one two en the third and last circle none, the first gate will move three spaces, the middle one two and the last one will not move at all. That being said, there are a few ways to block your opponent from simply moving on, namely standing on the space in front or behind a gate, will forbid your opponents from crossing the gate. This does not count for pawns that are not in front of a gate, as you’ll be able to leap over them during your turn for no cost. This means the space they are on will pretty much count as if it does not exist. Whilst the overall mechanics may sound fairly simple, there is a lot to keep in mind, making the game very strategic. Not only the ‘blocking’ mechanism might give you a breather once in awhile, but some misplaced pawns your opponents have on the board, might give you a gigantic boost. This is often a matter of planning. The movement of the gates is another such thing, as you’ll be able to pinpoint their place after the end of the round, if your opponents do not pull that many unexpected moves. This in combination with the turn order for the following round(s) will always help you plan your coming moves. You’ll notice that the more players join the party, the gates behavior will change accordingly. Things such as turn order will have an even more significant role in a two player game, as you’ll be able to plan two moves in a row. This makes up for a slightly more monotone match, but still a reasonably exciting one, if you plan your moves just right. 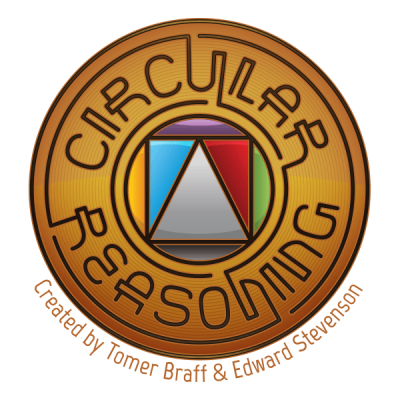 Circular Reasoning is a fun and healthy break from many luck based games. Even though luck tends to surface a little bit now and then, the game itself proves to be very strategic. Not only does the game offer many options with its limited scheme, it feels like an entirely different matchup if you play with more or fewer players. Overall a great game, if you feel like putting your mind to the test.